Test and measurement equipment manufacturers also have to evolve to support the changes in industry technology and working practices. As can be seen by industry organisations such as AIMS, it is essential for manufacturers and broadcasters to work together for the betterment of the industry and find solutions to the challenges that all in the industry face. Over the last 20 years, Omnitek has worked with a range of vision and video product manufacturers, broadcasters and media content creators. We are currently working with to implement HDR program brightness monitoring, for evaluation by the ITU, to reduce the eye strain caused by severe dark to bright transitions that are now possible. This is a need that is indicative of rapidly moving technological change. Recently, we have worked with several major broadcasters to integrate the Ultra TQ and Ultra XR systems into SMPTE 2110 IP-only environments using the Embrionix 3G 2110 compact gateway SFP module. We have also worked closely with Embrionix and a large system integrator to provide a single unit solution with all the tools required to perform 4K QC over an all IP, 4K, SMPTE 2110 network. In teaming up with Embrionix, Omnitek can provide a single unit solution with all the tools required to perform 4K QC over an all-IP, 4K, SMPTE ST2110 network. Some of the challenges for those integrating SMPTE 2110 IP environment are still ongoing and workflows are being established to resolve these. Interestingly, broadcasters performing program QC over IP networks now need to check video, audio and metadata flow content to ensure that the content is actually present and that the packet interval timing is correct to ensure that all packets appear on time for server ingest and playout. Omnitek provides a range of test and measurement equipment that is in daily use by manufacturers, broadcasters and media organisations to deliver program content to the viewer. These are evolving to cover the needs of new technologies and workflows. Omnitek’s flexible upgrade and support approach allows customers to purchase equipment now, knowing that the equipment is a future proof investment. This is backed-up by the Omnitek “Ultra Passport” care package which further supports Broadcasters and media organisations in these challenging times. The Ultra 4K Tool Box is still a highly attractive solution for Manufacturers designing and evaluating their own QL 3G-SDI, 6G-SDI and 12G-SDI products and continues to benefit from functionality developed for the Ultra Family of T&M products. The Ultra XR is the instrument of choice in Post for anyone wanting to grade and quality control HD, SDR, 4K and HDR content. It provides all the traditional tools needed to work with DI - high-resolution waveform display, vectorscope, CIE chart etc - and engineered specifically with 4K/UHD in mind. The Ultra XR supports 12-bit 4:4:4/4:2:0 SDI input formats in YCbCr and RGB, along with Wide Colour Gamut RGB - ITU-R BT.2020 and High Dynamic Range (HDR) inputs - ST2084 / PQ and Hybrid Log Gamma. Now with support for SMPTE 2110 / SMPTE 2022-6 HD video with 2110 4K support being demonstrated at IBC. The Ultra TQ supports the analysis of video over SDI or an IP link as a SMPTE 2110 / SMPTE 2022-6 stream with full dual PTP support. In addition to its comprehensive set of video instruments, the Ultra TQ now has the ability to analyse and decode Dolby E, Dolby D and Dolby D+ audio for monitoring and quality checking. This ‘all in one’ solution is proving very popular with broadcasters who are looking to find a solution to ‘do more with less’. The AES/EBU audio connectivity allows audio from the SDI/IP stream and decoded Dolby content to be monitored. To support the integration of the Ultra XR and Ultra TQ analysers into the SMPTE 2110 environment, we have provided a sophisticated set of configuration tools that allow either the setup of the system either locally or via NMOS control. This make the system installation far easier as individual units can be fully configured before even being connected into the network. The Ultra XR has been chosen in several installations because it provides the connectively and breadth of functionality that is require with the standard compliance tools that are mandatory for program makers in the US. 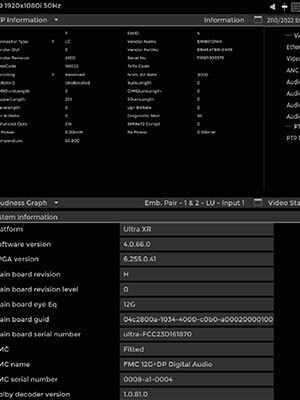 The Ultra XR provide tools such as loudness logging, closed caption display, gamut and metadata monitoring, Dolby metadata and decoding for program QC and compliance of SDI and IP content. The Omnitek team will be available at NAB to discuss its solutions for R&D / Manufacturing, Post and Broadcast. Come and see us at Booth C6630.